Chuck founded Fast Lane Americas in May of 2005. He has been in the Cisco Training Business for over 10 years. Mr. Terrien was responsible for the general management of a large multi-national …Read more Cisco delivery business as well as a WW Cisco training business development position. Prior to that, he held various technical and managerial positions in the IBM Networking Hardware and Software Divisions. He has a Bachelor of Arts degree in Business from Michigan State University and a Masters of Science in System Science from the State University of New York at Binghamton. James has been working in IT for 15+ years. He began running sales in 1998 for a high tech start up in APJC that was purchased by a large Networking vendor in 2000. At that company over his 7 years he served as Product Manager, Sales and Business Development in various technologies for the whole …Read moreof APJC with particular geographic focus on China, Japan, India and Australia. James started his own professional services company that worked with many of the leading IT vendors across the theatre. Since then he has served as the GM of APJC for a number of US and European based companies entering the APJC region. His last role before ITLS was GM, APJC for a high end Data Center Consultancy outfit. Jesús has 25 years of experience as Sales Account manager, Sales group manager, Managing Director and member of different Boards. Before he started the position as Managing Director for Fast Lane Spain, he held several Managing director positions in France, Italy, Portugal, Switzerland …Read more and Spain during 20 years in international companies such as Digital Equipment Corporation, Dow Jones Corporation or Global Knowledge Network. James studied Marketing at Birmingham University for 4 years before undertaking his first executive role at Westcon UK Ltd, the distributor of leading-edge networking technology products. Providing marketing support for a number of Westcon’s leading vendors such as …Read moreBritish Telecom, Nortel Networks, Extreme Networks, 3 Comm and Packeteer. After 2 years James moved into the IT Training industry and has never looked back with 10 years experience under his belt. James joined Fast Lane in February 2010 and is ultimately responsible for all of Fast Lane marketing activities including strategic decisions, engaging with vendors and partners and overseeing the execution of the marketing plan ensuring it’s on time and within budget. Oleg has 10 years of experience in the Cisco training business with several of the world’s leading CLSPs. He has worked as Sales Manager, Partner and Key Account Manager and Partner Development Manager. …Read moreAlso, he has managed 2-Tier partners (CLPs and Sponsored Organizations) across EMEA for over 4 years. Oleg is an effective communicator and trusted advisor while being very successful at strategic planning within a dynamic business environment. Tilen brings over 10 years of experience in IT education field with extensive international experience in educational program development, business development, sales & marketing, customer relations, business operations and new technology initiatives. …Read moreHis professional path began with Compaq educational services where he was in charge of delivery and development of programs for European and African regions and continued with Program Management for Micro-soft and Hewlett Packard Educational Services through European Learning Partners. Tilen was in the past working for a Hewlett Pack-ard and Microsoft Training center as well as for Cisco Learning Solutions Partners. Tilen is now on a position of Managing Director at Fast Lane Slovenia, responsible for Central and Eastern Europe. His current position combines all his previous experiences and gives him an opportunity to develop new business, such as IBM (implementation of N-series courses), VMware (implementation of training into Central and Eastern European region), etc. Bogdan Stashchuk has an exceptional experience in IT. He worked as a network engineer at National University of Taras Shevchenko, Kiev, before he entered IT training business as a Cisco Instructor. After gaining his CCIE certification, Bogdan had been involved in …Read morenumerous complex integration projects as an architect. He also held an executive director position at one of ukrainian IT training providers. Bogdan’s excellent management and planning skills allow him to develop successful and profitable business strategies. Barry has been working in IT and Security consulting and training for 17 years, as well as holding a Master's Degree in Education. Over his career, Barry has had the experience of growing and selling a successful training business,…Read more directing and expanding professional services for an IT Security Firm, and continually working to innovate courses on security and advanced networking technology. He has a passion for bringing the "new" to market; this includes accelerating vendors' Go-To-Market plans by envisioning and delivering on cutting edge technology training. He is also the author of several publications, including co-author of the "Official Certified Ethical Hacker Review Guide". David recently joined Fast Lane from Cisco Systems where he served over 12 years focusing on advanced data center, mobile and video solutions. David has over 20 years of experience in product line management, with a wealth experience in product life cycle management including concept …Read more,market research, development, launch, cost reduction, end-of-life and forecasting. Due to his broad knowledge base in both Product Line Management and Advanced Technologies, David will focus on the problems facing IT professionals as the industry migrates from traditional monolithic data center models to virtualized data centers and cloud computing. This focus will also include the linkages between multiple solutions such as IOT, Big Data and much more as part of Fast Lane’s Enabling Digital Strategies (EDS) initiative. David holds a BS in Electrical Engineering from Louisiana State University in Baton Rouge. Kori is an experienced Business Development and Technical Marketing leader who has held various engineering, marketing and business development roles during his 20 year IT career. He is a passionate, …Read morecreative, results-oriented, servant-leader skilled in empowering C-level executives to leverage industry-leading transformative technologies in order to achieve their expected business outcomes. Kori is experienced in uncovering creative ways to drive new business expansion for Service Providers, Enterprises, vendors and partners in a manner that is mutually beneficial for all parties. He has defined multi-phase global field marketing campaigns, emphasizing thought leadership and new solution launches for Internet of Things as well as Cloud-based software and services (SaaS). Kori oversees Cloud, SDN/NFV, Collaboration and DevOps related training and consultancy services within Fast Lane’s Enabling Digital Strategies portfolio. Luis has worked for Unisys Corporation most of his career in Executive Management positions, leading technical and consultant business groups and providing value add in complex technical Integration Projects in several Latin America countries. …Read moreAlso, he is an expert in business planning and organization, and a consultant expert in business process transformation in banks and business alignment. He also had direct sales roles coordinating sales groups of technological products across Latin America. Luis is a Computer Science engineer and has an MBA with a Marketing major and post-graduate degree in Tele-communications. He was appointed Information Services Director since 1999, Certified Principal since May 2000 and Certified Partner since 2003. In 2004 he was responsible for the consultant practice of Retail Banking for Latin America including Mexico and Brazil. He had the responsibility of over one hundred consultants and 23 managers, and had a total services quota over USD$7.5M. Michelle has worked in the area of management and education of Information Technologies for over 8 years. She developed her profession with Licencias OnLine, a market leader …Read morein the sale of software licenses in Latin America. She worked as Product Manager of LOL Education and developing an education based portfolio with Cloud & Virtualization, and Security. Primarily support your virtualization strategy with VMware Authorized Training Center. Of her abilities, what most stands out are her skills of forming and leading high-outcome groups, as well as managing geographically distributed groups, both with creativity, a solid base of knowledge, and an innovative attitude. She is committed to her relationship with clients and business partners, development of solutions value-add with formation and IT certification. Since 2014 her responsibility is Commercial Director of Southern Cone (Argentina, Chile, Uruguay and Paraguay). Claudia has over 16 years of experience in IT Industry, always focused on the training field. She is a professional in Education from the National University of Colombia and has worked in the telecommunication and IT field, managing companies specialized in designing and …Read moreselling training solutions for multinational corporations, channels and end users. In Fast Lane, Claudia is in charge of business development and sales of Colombia and Venezuela offices. She is also responsible for Cisco relationship as well as alliances building. Jesus is a System Engineer of the Universidad Nacional de Ingenieria and Administrative Engineer of the Univeridad Inca Garcilaso de La Vega with more than twenty years of experience in the area of management and education of Information Technologies at level superior,…Read more he has experience on the management of development projects and implementation of Information systems with wide experience in the direction of training centers of Networking and IT with responsibility in the Commercial Corporate area. In the area of training centers of information and communication technologies, he has more than fifteen years of experience. He has taken part on the creation of the first Cisco Learning Partner in Peru in 1998 and he also participated in the creation of the first Cisco Networking Academy in Peru in 2003. Nowadays, Jesus is the Country Manager of Fast Lane, Peru with commercial responsibilities in the countries of Ecuador, Bolivia and Peru. Linda joined Fast Lane in 2010 as COO and Operations Director for ITLS South APAC out of Singapore. Previously she has been working in Singapore as Regional Manager for NIL Data Communications where she gained experience in the training industry. …Read moreLinda has a strong business experience in Asia, she has worked as Project Manager and Operations Chief in China as well as Business Consultant for the APAC region. Linda worked for four years in Shanghai and was responsible for pavilion operations. Linda is fluent in Mandarin. Madhu has over 15 years of experience in IT Training, Banking & Service Industry, He is anElectronics & Communication engineer and has an MBA with Marketing major and holds Research degree in MPhil – Management. He has …Read morePreviously worked in companies, that includes GTE, ABN AMRO Bank, India Bulls, Integrated Enterprises (I) Ltd &iRis Technologies in India. He has had direct sales responsibility for IT Majors, SME’s, Defence, global customers and all types of channels in the IT environment. As Training Head for GTE he was in charge for 3 countries [India, Sri Lanka & Bangladesh] and had management responsibility for Sales, field sales marketing, field sales finance and delivery. Madhu has been actively involved in building strategies and implementing across India, Sri Lanka & Bangladesh since inception of the training business in GTE. Rachel served as COO for ITLS for the last 5 years before the merger with Fast Lane took place. She has over 15 years of experience in mul-tinational corporations and private enterprises…Read moreRachel is Managing Di-rector for ITLS/Fast Lane in Hong Kong and leads sales and business development for Greater China. Lisa had graduated in Law School and has over 12 years’ solid experi-ence in IT Training Industry. She is familiar in providing IT training solu-tions to customers from telecommunication, multinational corporations, service providers as well as large enterprise companies. …Read moreLisa works as Regional Manager and in-charge of business development, learning partner recruitment and sales & marketing. The Fast Lane Group ranks amongst the world’s leading independent Cisco training providers, and is the only worldwide learning partner for NetApp. An experienced Cisco Learning Solutions Partner of long standing, Fast Lane is represented worldwide with subsidiaries in all regions. 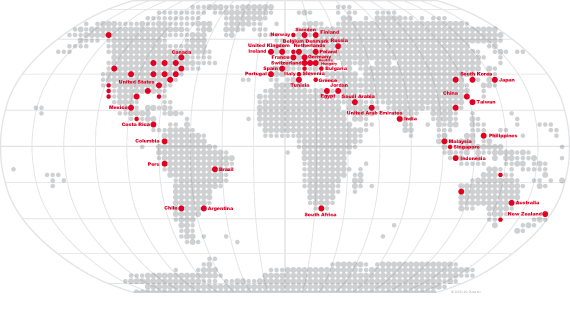 The firm’s head offices are in Berlin, Cary / NC, San Jose de Costa Rica, Ljubljana, St. Petersburg and Tokyo. Fast Lane has earned a reputation as a first-call company for sophisticated networking projects, entailing both consultation and qualification programs. Alongside Fast Lane developed training courses, the Cisco curriculum encompasses Cisco Routing & Switching, Design and Service Provider courses. Special training in the areas of Cisco Unified Communications & Video, Data Center & Virtualization, Security and Wireless completes the Cisco course offering. In addition to authorised Cisco, NetApp, Symantec and VMware training, Fast Lane also offers courses from other major organisations such as Brocade, Check Point, Citrix, CompTIA, HP, Lotus, LPI, Microsoft, Novell, Oracle, Red Hat, RSA Security, SAP, Sun, Trend Micro and ITIL.